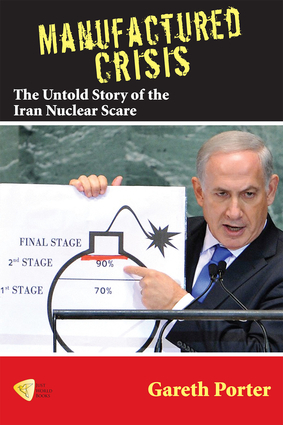 In Manufactured Crisis, investigative reporter Gareth Porter shows how Israel and the George W. Bush administration successfully waged their campaign claiming that Iran was trying covertly to acquire a nuclear weapon. Porter shows in detail that most of the so-called evidence for such a weapons program was of dubious origin, including the documents that allegedly originated from the laptop of an Iranian nuclear scientist. As Iran and the United States have engaged in serious negotiations over Iran’s nuclear program, this book has provided crucial background material for those who want to make an independent assessment of the record, rather than relying on highly politicized allegations. Gareth Porter is an investigative journalist, historian, author, and analyst of U.S. foreign and military policy. Porter has written four books, including his seminal work on Vietnam, Perils of Dominance, and his writing has been published in such outlets as Al-Jazeera English, The Nation, Inter Press Service, the Huffington Post, and Truthout. He was the 2012 winner of the Martha Gellhorn Prize for Investigative Journalism.